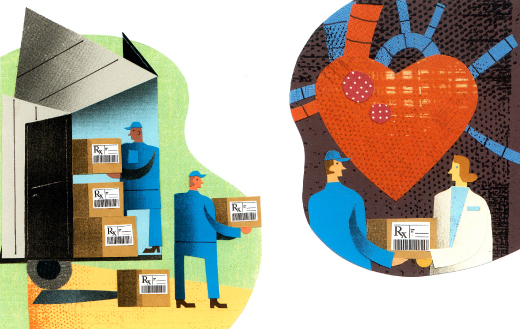 To understand nanotechnology, think big: a truck delivering packages of drugs to a specific address in the body. In cancer detection, researchers inject nanoparticles tagged with fluorescent dyes and follow them through the body, the dyes acting like tracking numbers on a package to locate where cancer cells have accumulated. For cardiologists, nanoparticles offer the possibility of slowly releasing a minute package of anti-inflammatory drugs to the heart to soften the scars that usually appear after a heart attack. Using nanotechnology, immunologists can design sophisticated vaccines to deliver substances that stimulate the immune system to specific sites in the body, while avoiding others that the drugs might harm. In the joint department of biomedical engineering at Emory and Georgia Tech, Shuming Nie and colleagues are developing tools to help surgeons define the tumor margins of cancer in human patients. The particles consist of a polymer or gold base coupled to a fluorescent dye and protein that adheres to molecules on the surface of tumor cells. The gold in the particle greatly amplifies the signal from the fluorescent dye. Nie and his team have shown that in rodents the particles can be used to detect tumors smaller than one millimeter. Now funded by a grant from the National Cancer Institute, they are working to move these tools closer to application in people with three especially deadly cancers: lung, pancreatic, and metastatic breast cancer. Using a small, handheld imaging device, surgeons will follow the nanoparticles in a cancer patient to see where they go. “This technology could allow the surgeon to directly visualize where the tumors are in real time,” Nie says. The technique could improve removal of the primary tumor and affected lymph nodes. Emory surgeon Charles Staley says the extra information provided by nanoparticle imaging could be critical in planning a surgical approach. For example, some pancreatic cancers have presented such logistic challenges that they are inoperable. Nanotechnology puts another tool in the surgeon’s hand to make such procedures possible. While cancer-fighting nanoparticles travel through the body to detect tumors, scientists have a different goal for using nanotechnology to treat damaged hearts: a stationary package that releases its contents gradually. Nanoparticles developed by Davis and a colleague at Georgia Tech are between 10- and 20-millionths of a meter. By comparison, Nie’s cancer-seeking gold nanoparticles are 60 to 80 nanometers: hundreds of times smaller. The cells that Davis and his team want to target are macrophages: inflammatory cells that appear in the heart after a heart attack and promote harmful scarring. Normally the macrophages attack bacteria and viruses, but they also have the ability to break down polyketals, smuggling the contents of the particles past cell membranes in the process. This method of delivery allows scientists to duplicate the effects of injecting an anti-inflammatory drug into the heart twice a day over several weeks. Simultaneously, they avoid the toxicity that would result if the whole body were exposed to the drug. So far, the approach has worked in rodents. Currently, the researchers are working to expand the reach of the polyketal technology to deliver a greater variety of payloads and reach different cell types. They are loading a tool for selectively blocking the activity of just one gene into polyketal particles. The next step is to merge polyketals and sugar molecules to deliver a package to cardiac muscle cells. Williams recently found that a protein, RANKL, may boost the effectiveness of mucosal vaccines. Specifically, treating mice with RANKL causes an increase in specialized M cells that act like conveyor belts to transport small particles in the intestine. RANKL could have an unacceptable side effect if delivered throughout the body because it stimulates osteoclasts, or the cells that break down bone. Williams has teamed up with colleagues at Emory and Mercer to generate tiny capsules that contain RANKL to deliver the protein to the intestines. The advantage of this method is to deliver the protein only where it needs to go while blocking it from blood and bone. In another Emory lab at the Yerkes National Primate Research Center, Bali Pulendran’s team is imitating the structure of viruses to create immunity-enhancing particles that could strengthen several vaccines. Their approach grows out of work on the immune response to the yellow fever vaccine. Video: "Nanotechnology to Improve Cancer Treatment"